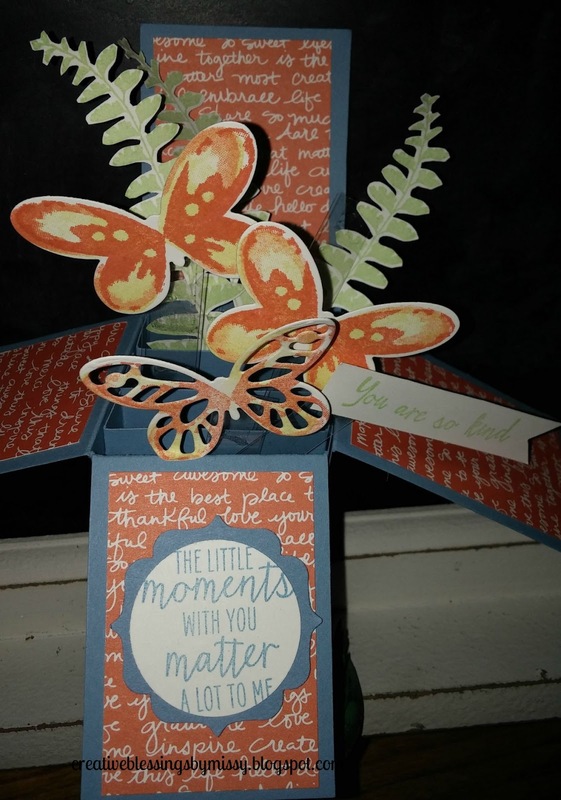 Welcome back to the RemARKable Stampers Blog Tour! This year we are going to focus on Bundles. 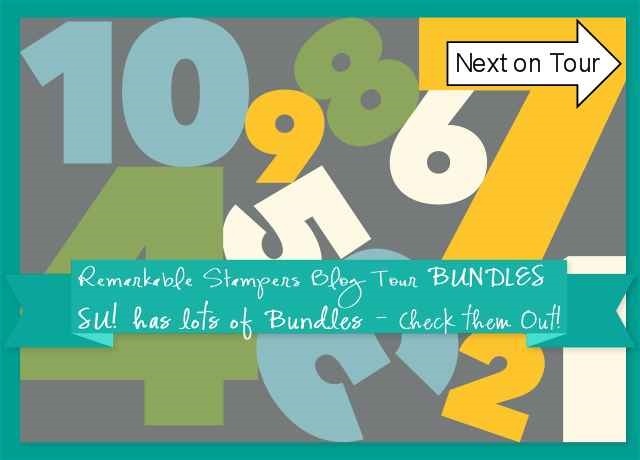 Stampin' Up has so many great bundles in the Annual Catalog - Bundles are a pairing of two products- usually a stamp set and the second product is either a punch, set of framelits or other product. 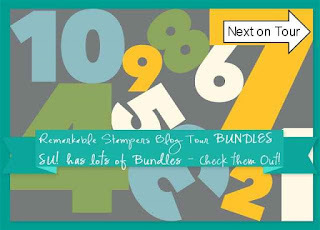 These bundles are offered at a savings of 15%. I love when I can purchase products at a savings! Hope you join us on the second Thursday of each month at 8 PM to be inspired! 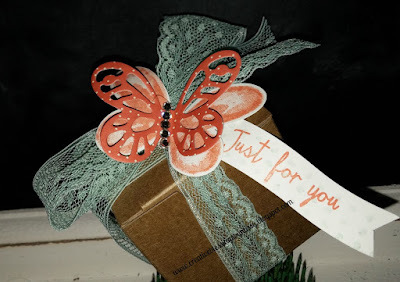 This month I choose to feature the Watercolor Wings Stamp Set and Bold Butterfly Framelits Bundle which is on page 75 of the 15-16 Annual Catalog. First project - if you know me you know that I love to give and leave little gifts! Here's an adorable tiny treats gift box! Simple, quick and easy! 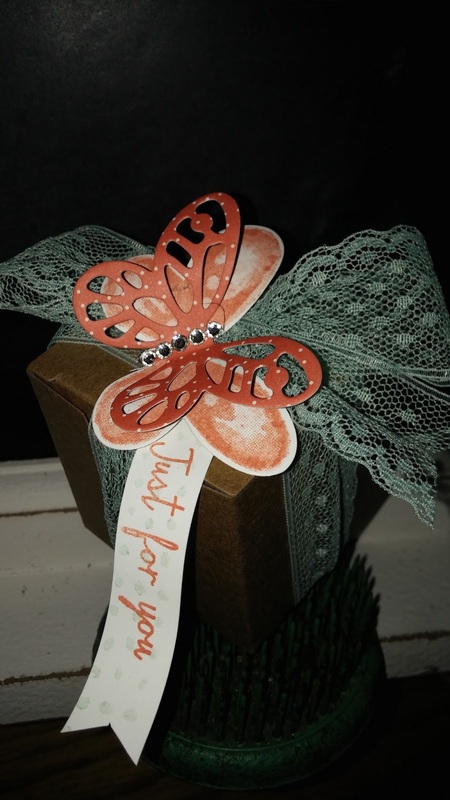 The treat boxes are on page 151 - #135829 - Tiny Treat boxes- 25 (2x2x2") boxes get for chocolate treats, jewelry, or cash!!! 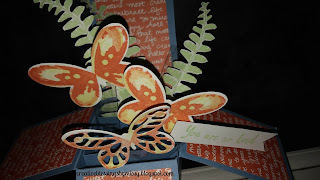 I triple stamped the small butterfly with Calypso Coral ink and cut it out with the framelit (from a matching set) then cut out the top butterfly from a piece of DSP from the Pretty Petals Paper Stack, added some Rhinestone Jewels and a quick tag was created with two other stamps from the Watercolor Wings Stamp Set. A piece of Mint Macaron 1" Dotted Lace Trim adds a really soft touch. Love how it looks! Next project is a little more involved! It's my first Card in a box card! This card can fold flat and be mailed in a standard envelope. There are lots of tutorials on line - I actually used two and took parts from both to create this card. 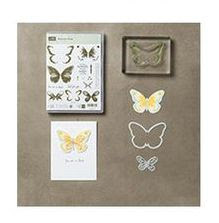 Butterflies are stamped with the Watercolor Wings Stamp Set, sentiments are also from this set and the third butterfly is die cut from the Bold Butterfly Framelits. 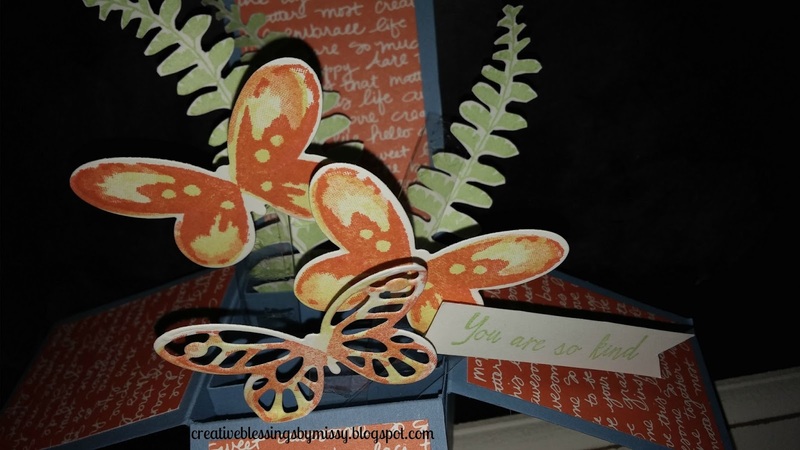 The ferns in the back are from the Butterfly Basics Stamp Set- stamped and hand cut. I love the way this card came out and am looking forward to creating many other cards and gift packaging with this Bundle! I'd love for you to leave a comment - what do you think? Feel free to Pin these samples if you are on Pinterest! Looking forward to see what she has created!